To be competitive, it is necessary in our days to automate the maximum of repetitive tasks. Also it is more and more necessary to share data with all kind of professionals. In a company, the developers, the technical writers, the translators, the proof-readers may all need to access the data; so this data can not be limited by software dependencies or requirements. Because User Databases are in plain-text format, all your data can be easily accessed via a macro from any text editor. If you are using DSCAN-UDM (Tradiciel), all your data is already structured and organized in different ASCII User Databases (The key is to have structured data that can be easily managed and that is not limited by any software's version). You can then use a macro to search these databases from within Microsoft Word or from within WordPerfect (Excel, or...) without being limited by language modules, format of the original document, software versions, nor the format of the data. The macro can then replace the selected text by the found string coming from your plain-text databases. The majority of word processing software on the market facilitate the process of creating macros and make it easy to "program" your working environment for your needs. We could imagine a DSCAN-UDM (Tradiciel) database having three fields: English, French and Italian. Suppose also a DSCAN-UDM (Tradiciel) database having three fields: English Version1, English Version2 and English Version3. From within you text editor, you could use a macro to search in this database for English words or sentences, acquire the correponding records from previous versions and insert it in the document. Macros are a series of commands and instructions that can be grouped as a single user command and run automatically. Instead of manually performing a series of lengthy, repetitive actions, the user can create and run a single custom command that accomplishes the recorded actions. For example you can automate the search of your DSCAN-UDM (Tradiciel) User Databases. 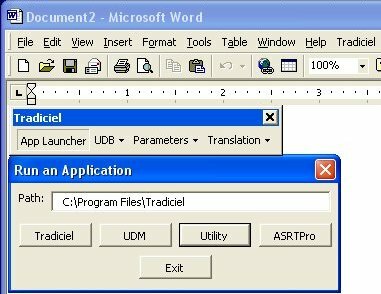 Open MS Word, On the Tools menu, click Templates and Add-Ins, click Attach, and then select the template you want (Tradiciel2001.dot, dscanudm.dot...), click Open, then Ok.
For example if you press on the App Launcher you will get the following dialog box. If you press the buton UDM, the following code will launch the executable Udbman.exe delivered with DSCAN-UDM (Tradiciel). You can change the code to call any other executable that you want.
' Test if folder exists. You can also make a macro that searches all the ASCII databases that you have created previously. You could for example highlight a word and search it in all your ASCII databases. In this example the search is done on bilingual ASCII databases, but it could really be anything else (Address, phone numbers, email - Artists names, movie titles, description...). Here is an example of a dialog box that displays all the User Database Records located after the search is done. The user can double click the selected record to insert it in the Word Document.
' Get reference to the selected text. If SearchString = "" Or SearchString = " " Then  ' Check if the selected text is not only spaces. If Len(TextFromDocFile) > 1 Then ' Check the length of the selected text. If Trim(SearchString) = "" Then ' Check if the selected text is not only spaces. MsgBox "Search String Not Valid (Empty)." UserFormEnterNewTrad.Labelmesg.Caption = "String not found in selected UDB. Enter target string for UDB and/or document." After registering your DSCAN-UDM copy, we will send you the license file and an the open source code Word 2000 Template for DSCAN-UDM. You will have access to the complete code of our Word 2000 macro we are developping for DSCAN-UDM. Any customization can be done by editing the code located in this Word 2000 Template for DSCAN-UDM. Places that are more likely to need customization are documented in the code. This customizable code will be a great asset for your enterprise and gives you a good base to create your own application from within Microsoft Word 2000. We have to insist on the fact that the open code Word 2000 Template for DSCAN-UDM will only be distributed to registered users that have paid their DSCAN-UDM registration. For more information on how to create macros, see the on-line help of the text editor software you are using. Word offers two ways for you to create a macro: the macro recorder and the Visual Basic Editor. To get sample macros from Microsoft, go to http://www.microsoft.com/ and type "Macros9.dot" in the search field. You can type "Q237356" , "Sample Macros for Word 2000", "Q123606" , "Supplemental Macros for Word 6.0".